1Set the camera to Playback mode. 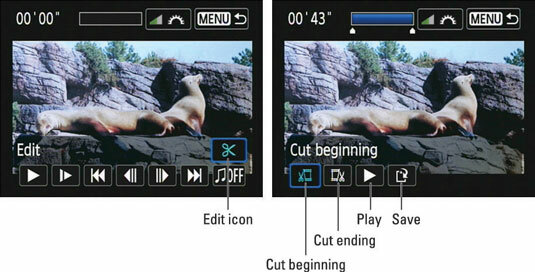 2Press the Set button or tap the Set icon to display the playback controls. Tap the Edit icon (or highlight it and press Set) to enter the Editing screen. The editing functions appear as a scissors icon. 3Tap the Cut Beginning icon. Or highlight it and press Set. The bar at the top of the screen becomes active and little arrows appear under the bar. The bar indicates the current length of the movie. 4Press and hold the right cross key to advance frame by frame to the last frame you want to cut. Press the left key to rewind frame by frame. Or tap those little arrows under the length bar to advance and rewind frame by frame. As you advance through the movie, the little blue triangle under the bar indicates the position of the frame within the entire movie. You can also tap the arrows under the progress bar to advance or rewind the clip. 5Tap the Set icon or press the Set button. 6Tap the Save File icon. Or use the cross keys to highlight it and then press the Set button. 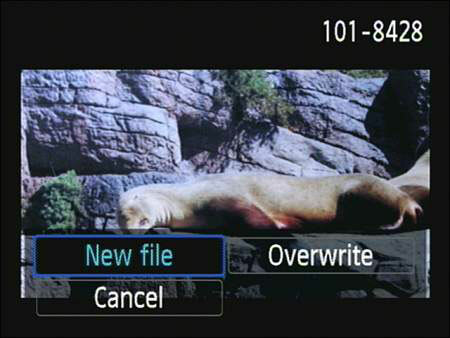 7To save the trimmed movie as a separate file from your original, choose New File. Just tap the New File icon or highlight it and press Set to get the job done. It’s safer to save the edited version as a new file. That way, if you decide that you did a lousy editing job, you still have your original. But if you know you never want the original back, choose Overwrite instead. 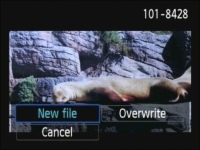 To trim the end of a movie, follow the same process, but choose Cut Ending in Step 4.